Grilled Polenta Crostini is your next favorite gluten-free appetizer! 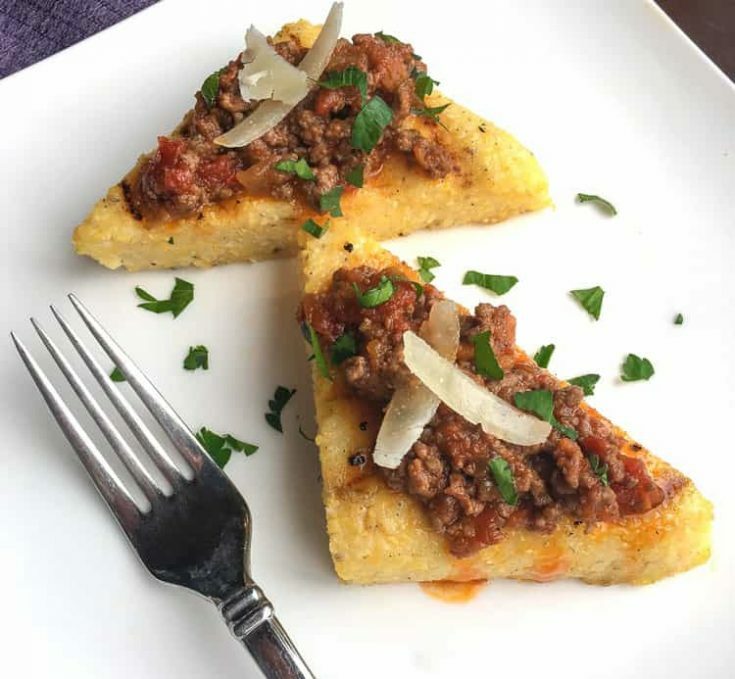 Top these hearty polenta wedges with Tuscan ragù sauce, shaved Pecorino Romano cheese, and diced parsley — or experiment to create your own favorite topping combination. This Grilled Polenta Crostini recipe is a seriously good appetizer. I’ve been on a big polenta kick lately because it’s so versatile (you can eat it creamy, grilled, and fried) and, quite frankly, it’s just really good. It’s hearty, naturally gluten-free, and pairs well with so many foods. 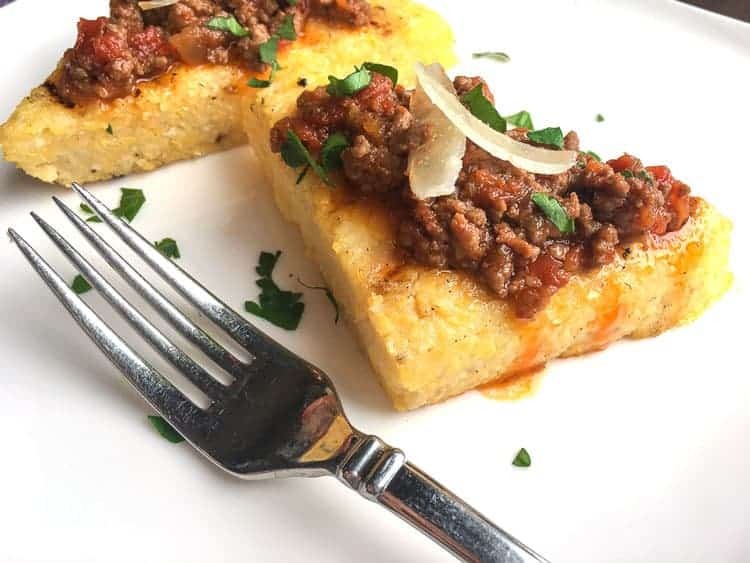 You’re going to love this particular polenta recipe for its versatility and great flavor. It might just be your next favorite appetizer! You could go pick up some ragù sauce at the store, but why buy store-bought when you can make it fresh in your kitchen? I highly recommend using this Tuscan Beef and Sausage Ragù recipe — it doesn’t disappoint! 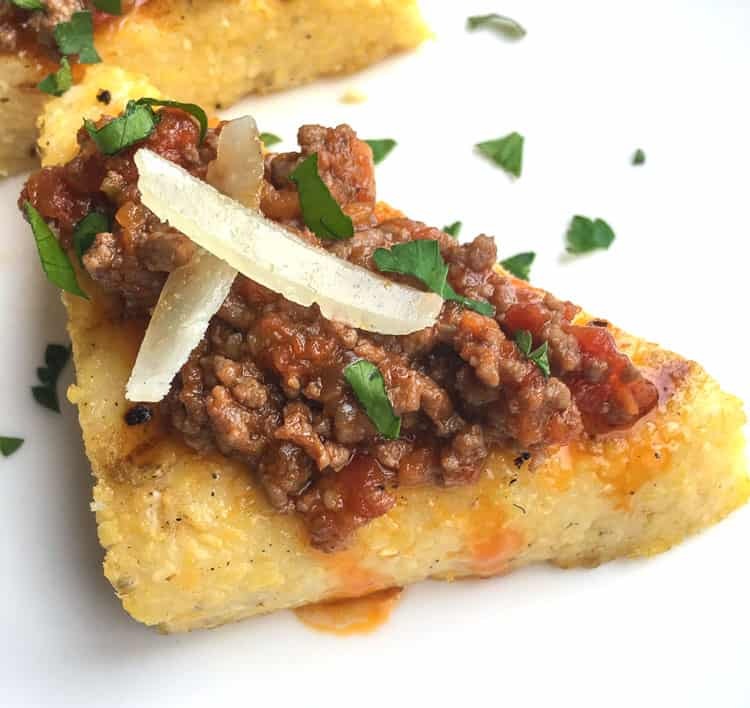 You can create a gluten-free lasagna by layering Grilled Polenta Crostini with meat sauce and cheese. You can also make gluten-free croutons by toasting Grilled Polenta Crostini and cutting it into crouton shapes. Grilled Polenta Crostini makes for a wonderful appetizer. Using olive oil, grease an 8” by 8” glass baking dish. (Alternatively, you can spray it with a non-stick cooking spray.) Set aside. Over medium-high heat, heat water in a large saucepan until it is almost boiling. Once the water begins to bubble, whisk in polenta. Stir continually until it begins to thicken. Season with salt to taste, then stir to combine. Reduce heat to just below medium. Then continue to cook, stirring every 4-5 minutes, until the polenta pulls away from the sides of the pan and becomes soft and tender. This will take approximately 40-45 minutes. Remove pan from heat. Stir in butter if using it, and add salt if desired. Transfer the cooked polenta into a prepared baking dish and spread it in a smooth, even layer. Cover and refrigerate the polenta until it is firm to the touch (at least 1-2 hours). Remove the baking dish from the refrigerator. Using a butter knife, gently loosen around the edges. Put a paper towel on top of the polenta and use your hand to hold it in place. Gently turn over the dish, supporting the paper towel and polenta with your hand. Tap the bottom of the dish until the polenta fully releases. Transfer (carefully) the solid piece of polenta to a cutting board. With a knife, cut the polenta into quarters, then cut each quarter piece in half diagonally so you end up with 8 wedges. If using a regular grill, heat the grill pan over medium heat. If using a gas grill, pre-heat to medium. Take a little olive oil and carefully brush each side of the 8 polenta wedges with olive oil before placing them on the hot grill surface. 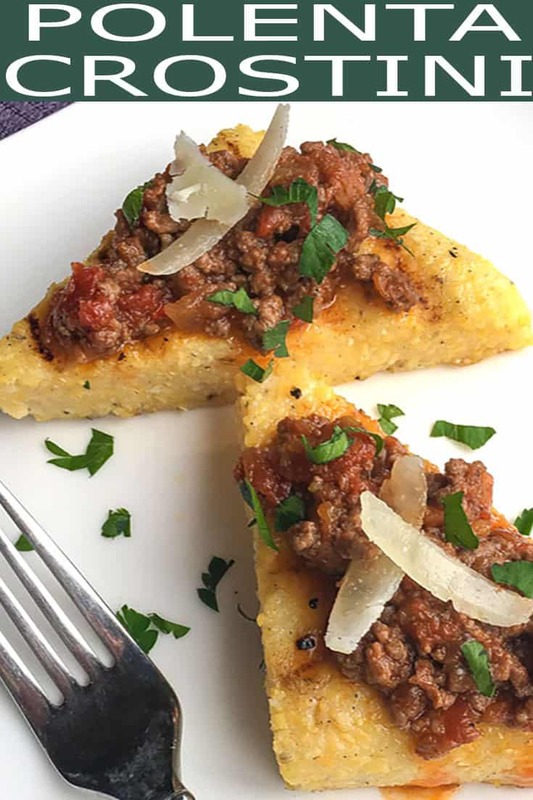 Cook each polenta wedge until they’re golden brown and grill marks appear. Flip and repeat on the other side. Serve immediately with your favorite toppings, such as Tuscan Beef and Sausage Ragù, then top with shaved Pecorino Romano cheese and chopped fresh parsley.